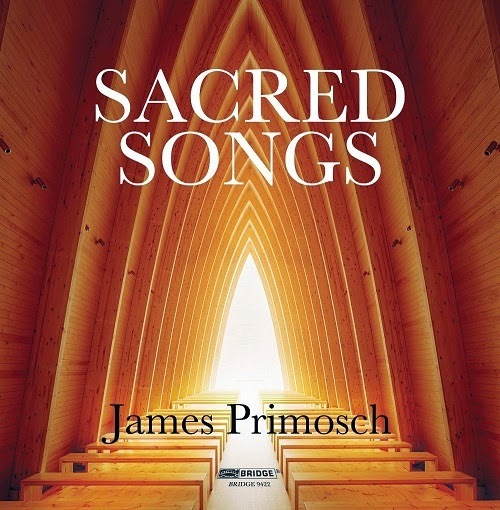 Whether you are a spiritual seeker or confirmed secularist, James Primosch’s affecting settings of sacred texts, and poems seeking the sacred or spiritual, can prove a balm for the soul and food for thought. On the Bridge CD Sacred Songs, this is doubtless assisted by the extraordinary talents brought to bear upon the material. Soprano Susan Narucki displays impressive range, diction, and dynamic control throughout the three song cycles she assays. Likewise, baritone William Sharp provides an intensity of declamation that is required by the song cycle Dark the Star. At the same time, his instrument retains its lyric timbre and suppleness. Primosch is quite fond of Rilke, and both Dark the Star and From a Book of Hours spotlight the poet’s work. Dark the Star also features fetching settings of poems by Susan Stewart. The juxtaposition of Rilke and Stewart supplies us with a postmodern vantage point on what it means to be seeking the sacred in art (John Harbison’s liner notes also gracefully illuminate this sometimes thorny subject). Four Sacred Songs deals with older texts and, in the case of Cordes Natus ex Parentis, a most familiar hymn tune. Yet Primosch’s distinctive scoring, filled with sumptuous textures punctuated by percussive tintinnabulation, make them his own. The 21st Century Consort, conducted by Christopher Kendall, have engaged in a long term collaboration with Primosch and it shows here in their incandescent and carefully prepared playing. (There are also elegantly arranged voice and piano versions of the songs – singers would do well to seek them out and program them). The earliest set represented here, Holy the Firm, is also one of Primosch’s most striking cycles. Once again we hear from Susan Stewart, alongside Denise Levertov, two poems by Annie Dillard, and a text from the 7th century AD by John Climacus. Usually, when dealing with a group of songs with poetry by multiple authors, one uses the term cycle judiciously and selectively. But Primosch has selected texts that speak to one another, about the sacred found in nature, about the bridge between temporal existence and eternity, and about the sense of meaning, transcendence, and poetry one can find every day, even, as Annie Dillard points out, on one’s deathbed. Not every composer’s music can support such weighty themes, but I find myself returning again and again to Primosch’s songs. Recommended. This entry was posted on Thursday, May 8th, 2014 at 9:26 pm	and is filed under The New Classical. You can follow any responses to this entry through the RSS 2.0 feed. Both comments and pings are currently closed.